The Stressless Metro Low Back (high) captures comfort and elegance as the latest addition to the Stressless furniture collection. Its stylish features send a bold message and stands out as a unique, urban addition to any room in your home or office. 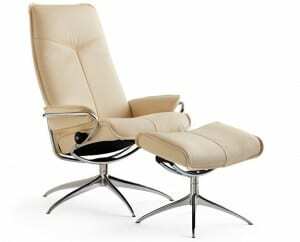 Not only does it look great, the luxurious comfort and support this chair offers will change the way you think about sitting. With a low back, simple lines, and padded armrests, you’ll instantly relax the moment you take a seat. Plush cushions support your body right where you need it. The Metra Low Back (high) guarantees comfort and ergonomic support you’ve come to expect from Stressless furniture. This sophisticated chair is designed to turn heads in any home or office. Specially crafted with a higher seat (18 ½”), this chair supports tall individuals of any size. Advanced ergonomic technology adapts to your body’s positioning for personalized support. Generous cushioning supports and releases all tension from your body. The classy, rotating base offers a 360 swivel for easy movement. There’s plenty to love about this chic chair. It’s urban flair and stylish design offer beauty and ergonomic support. You’ll love the luxurious comfort you’ll experience in your home or office with the Metro Low Back (high) chair. We ship to any address in all 50 United States. Ask for details regarding shipments to Canada. For quality assurance, all Metro Low Back (high) shipments must be insured for accident, loss, or damage. Once your shipment leaves our facility, a tracking number is provided via email. Unless otherwise stated, delivery means “to your door.” Shipments must be signed for by someone over 18 years of age.